Giverny. One word, Giverny, is all that is necessary when I tell about our trip. No country name, no city name. 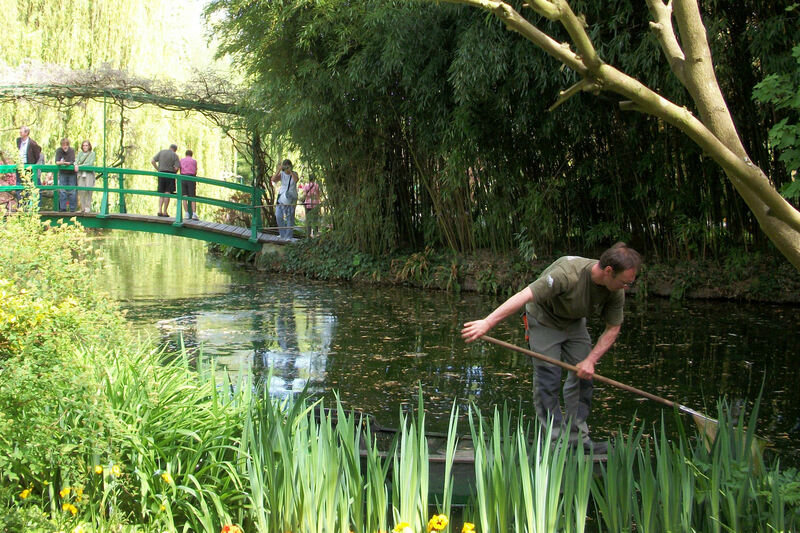 Nearly everyone knows the significance of Giverny as the home of Claude Monet. The name alone fails to provide a satisfactory image, however. The beauty and sense of Giverny has to be experienced in person. First a quick history lesson… very quick. Over the millennia, the forces of nature conspired to create one of the most beautiful places in France. People settled this area as early as Neolithic times and eventually named their settlement Giverny. These happy coincidences came together like critical mass, providing Claude Monet the inspiration for his most famous paintings. In 1883, after seeing the village from a train window, he rented and ultimately bought a lovely old country house near the village of Giverny. He applied for and was granted approval to reroute the river Ept in order to make a pond… care to guess where you have seen that pond and the iconic water lilies he planted? As Monet’s name became synonymous with the Impressionist movement, the village of Giverny became a haven for budding impressionist artists eager to learn from the master and to escape the pervasive criticism of their new thought-provoking style of painting. 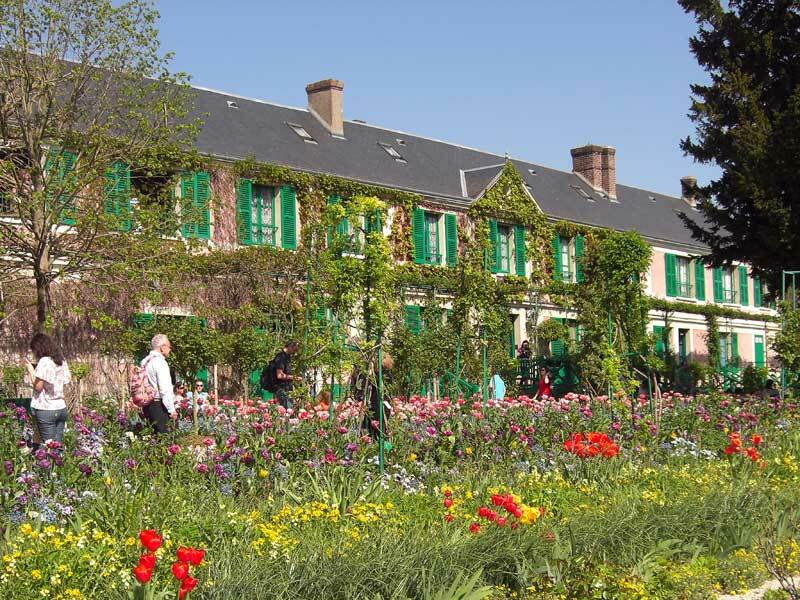 By 1900, Monet’s home was known simply as Giverny… that one evocative word. 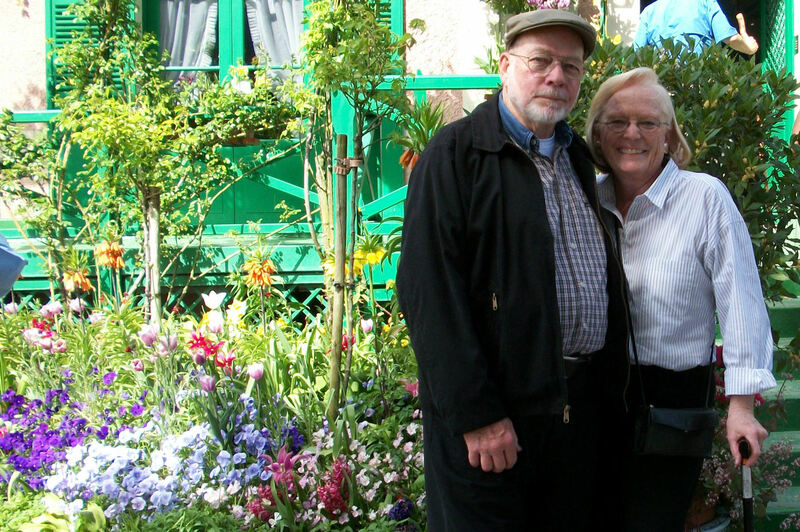 On this particular trip to Paris, my husband Bill and I agreed that April in Giverny was an experience we would not pass up. 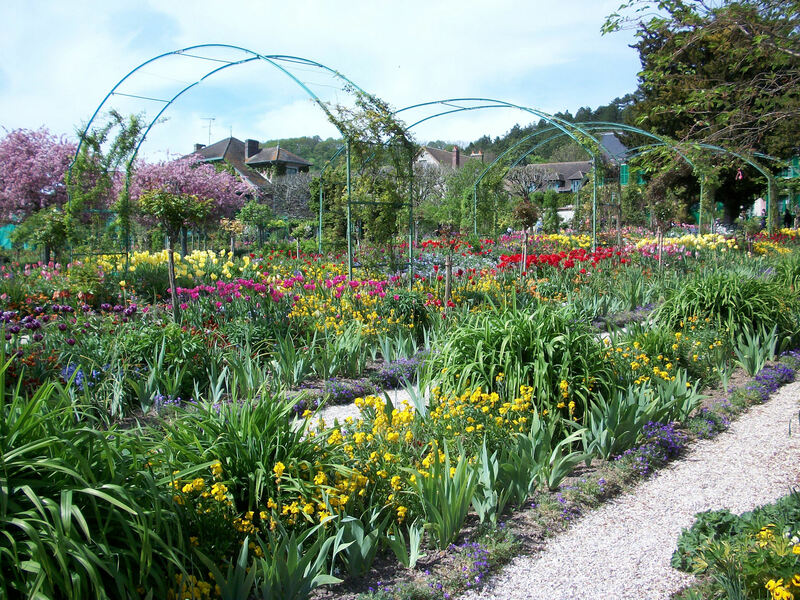 Day-trips to Giverny from Paris are relatively inexpensive and easy to arrange either by phone or via the internet through companies like Viator, ‎Paris Trip,‎ or Bonjour Paris. The buses leave from central Paris locations. Our trip, booked through Viator, left from Rue Rivoli across the street from the Louvre which was an easy Metro ride from the apartment we rented near the Eiffel Tower. Our bus arrived in Giverny at a parking lot rivaled in size only by the parking lot at Versailles. My first thought being, people will be 30 deep on the garden paths and pictures will be impossible. But, while taking pictures without people in them was impossible, the crowds were light and walking around was easy even with me still using a cane as a result of hip surgery. Monet loved this place with every fiber of his being. The depth of his love is apparent in every path and planting bed, in the small lily pond, the tulips, wisteria, azaleas, iris, the bridge and the lovely old house which are, in turn, all reflected in his paintings from 1890 until his death in 1926. As we walked the gravel paths in front of the house, I could almost hear the sounds of Monet’s children playing and the subdued sounds of gardeners clipping the wisteria. I was deeply into a vision of myself living in the village and volunteering my time maintaining the gardens at Giverny, when my ever practical husband reminded me that, regardless of my passion for this place, my skills with the French language would forever limit my dream of gardening in Giverny… even gardeners have to talk to people. Thanks, Honey. But, I persevered in my attempts to feel a part of this place even for a short few hours… to appreciate the lilt of the tulips as they gently bent to the light breeze… to, oh damn, I just inserted myself into another tourist’s picture. That makes around 20 unintentional insertions and we are still in the garden. Being a tourist AND a dreamer is harder when there’s a crowd… even a small one. The house alone was a joy for my partially color blind husband who reveled in the bright yellow painted dining room, the blue and white tiles throughout the kitchen, the pink outer walls with green shutters, the blue sitting room with brightly contrasting tile floor. Monet had a hand in the selection of all the paint colors in the house and replaced many windows to allow more light into their home. Tourists are not allowed to photograph the inside of the house, so you’ll just have to trust me… it is gloriously colorful. Or you can go online and check out the inspired color play for yourself. Gardener on the famous pond. The sense of Giverny is indescribable and my pictures only begin to do justice to the beauty of the gardens but, the pictures and my trip journal provide me with reminders that I walked the same paths and viewed the inspirations for Claude Monet’s most famous works of art. Very nice post about Giverny. Loved the pictures. Agreed! Sandy took some awesome pictures. Makes me feel like I’ve taken a step into some of those famous paintings. Bravo. What a wonderful walk through such a beautiful place. You made it seem just like we were there with you. The pictures are beautiful too. I’m ready to sign up for a trip right now! Great job in making Giverny come to life for those of us who have not been there!